GREENPOINT — This infamous business has flown the coop. A longtime chicken factory on Greenpoint Avenue loathed for its stench has finally shuttered, officials said, to the delight of neighbors who had complained for years over the smell. 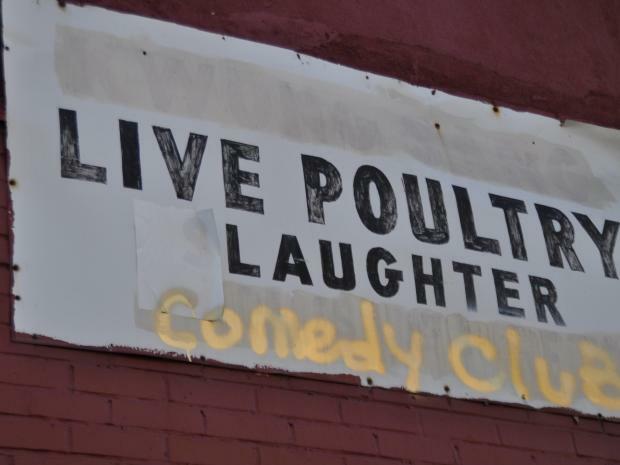 Lee's Live Poultry Slaughter — graffitied over this fall to read "Live Poultry Laughter Comedy Club" — is now closed, Williamsburg Councilman Stephen Levin said. "They flew the coop," he giggled at a recent Williamsburg Community Board 1 meeting, "so this is a good thing for the entire community who's had to live with it and smell it." Levin said the business had closed of its own accord, after state officials visited the site. The New York State Department of Agriculure and Markets referred the matter to the USDA, which did not immediately respond to requests for comment. The slaughterhouse's closure, Levin said, lifted a major burden off nearby residents who had been griping for years. "Wev'e been getting complaints as long as I've been in office...it was really bad," he said. "I know people on Milton Street who couldn’t use their backyards because it smelled." The owner of Lee's did not immediately respond to requests for comment at the number listed for the company.